He was the only person to go from the very bottom of the Navy to the very top, from seaman recruit to Chief of Naval Operations. He was also the first CNO who did not attend the Naval Academy. In 1956 Jeremy "Mike" Boorda dropped out of high school and enlisted in the Navy. In 1994 he became the Navy's military leader. When someone came into my office May 16 to say the CNO had shot himself, I (like everyone else) refused to believe it. Even listening to the announcement by the Secretary of the Navy on CNN, I thought he must have been assassinated. Word of a suicide note convinced me this had really happened. News reports said he had been told at 12:30 that Newsweek reporters were arriving in two hours, to interview him about combat decorations he had worn until last year. After saying he would handle the interview by telling the truth, he suddenly announced he was going home for lunch instead of eating in his Pentagon office. Brushing aside his driver, he drove himself to his quarters on the other side of Washington D.C.
By the time his driver found another care and reached the house, the CNO had walked into the back yard and shot himself in the chest with a .38 caliber pistol. When he joined the Navy at age 16, Mike Boorda wanted to get away from a troubled home life. His parents were having marital difficulties and life was painful. The Navy offered a better alternative than skipping school and drinking beer. He married at 19, and had four children in four years. In 1962, a first class personnelman with a GED instead of a high school diploma, he was selected for Officer Candidate School. Well-liked and good at everything he did, he rose rapidly through the officer ranks in the following years. My mother and sister and I met him at a WAVES reunion in San Diego in 1989. By then he was Chief of Naval Personnel, with the rank of Vice Admiral (3 stars). He has been Mom's hero ever since; she was waiting for him to retire from the Navy and run for President. I heard Admiral Boorda's "state of the Navy" speech only three weeks before his death, at the Naval Academy in Annapolis, Maryland. He talked about one-on-one leadership, and said there could be no suicides if every Sailor had one leader who knew that Sailor well. He said we must accept public scrutiny of our mistakes: "If you fall into the trap of not looking into problems, of feeling sorry for yourself because your problems are getting reported, you don't get better. I'm not going to fall into that trap." He emphasized that important topics are always controversial, and said his goal was to leave the Navy better than he found it. Right up to his death he appeared stable and upbeat. He seems to have displayed none of the classic symptoms that indicate a person is depressed or contemplating suicide. The Newsweek inquiry apparently pushed him over the edge. His suicide note was quoted in The Washington Post as saying he was afraid some would never believe he had made an honest mistake by wearing "V" pins on two of his medals. Those who have earned combat medals are justifiably concerned about false claims to combat status. Army and Navy rules differ. The Navy requires participation in combat operations and does not mention valor; the Army looks for valor in combat. Navy rules during the Vietnam War were so unclear confusion still reigns, as evidenced by conflicting opinions about Admiral Boorda's medals. Many Navy personnel assumed they earned a "V" because their ships conducted off-shore combat operations. When Admiral boorda was informed last year the "V" pins on his medals might be unauthorized, he immediately removed them. No one knows why word of the impending interview sent the CNO home to put a bullet through his chest. Newsweek had a valid point in insisting journalists should "be judged on what they publish, not what they inquire about." Perhaps Newsweek would have killed the story after learning the CNO had stopped wearing the devices over a year ago. It would be nice to think vile personal attacks in print will decrease as a result of this tragedy, that journalists and readers will remember people in the public eye are real people with real feelings. But I'm not optimistic about that. There has been much gloom and doom about the future of the Navy since Admiral Boorda's suicide, and rehashing of every negative incident since Tailhook '91. One commentator expressed surprise the Navy is still functioning so well. Of course, it is. Navy personnel are trained to operate independently and adjust to changes in leadership. Losing a CNO, however great he was, won't affect what we do or how well we do it. 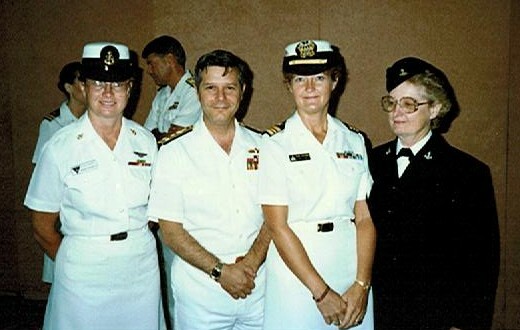 Admiral Boorda devoted his life to the Navy he loved. Always willing to admit mistakes and strive for improvement, he tried to balance the good of the Navy and its people against political and budget pressures. He may have chosen death before dishonor, wanting to avoid creating a scandal by an error on his part. Why he couldn't predict the scandal his suicide caused is an unanswerable question. He did so much for the Navy and meant so much to all of us; we respected him and were proud of him. We would have stood behind him if he admitted the pressures of the job were getting him down, and would have forgiven much greater than wearing questionable decorations on authorized medals.